Andrue: This week in programming, the Camera Hunger Games is over. A mutant victor arises! The new User Interface takes its turn in the spotlight, and it is no longer safe to leave the base! You’re likely to run out of battery, meaning no motor! No light! No drill! What will we think of next?! Volvary: What’s in your cargo, you ask? 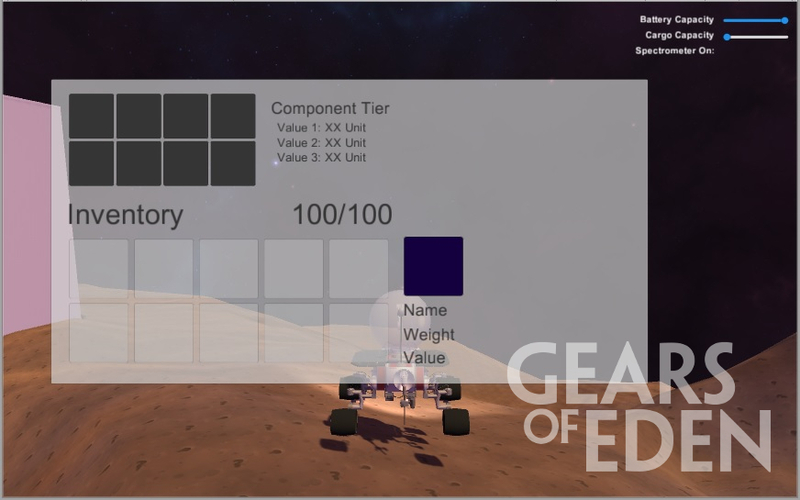 What pieces are mounted on your rover? Now you can know! ​_(sort of…)_​ While still incomplete, the Status is now rigged to be shown and used. Eric: Writing for video games is complicated. We want to tell a genuinely great story with Gears of Eden, but that’s difficult. Typically when one writes, they’re thinking of a series of events that’ll happen the same way every time. Because of course they will, they’re words on a page or they’re a frames in a movie or show. Neither of those are dependent on the user behaving in a certain way. Never before has a movie ended abruptly because Sylvester Stallone was too close to the corner of a wall when he shot his rocket launcher or wanted to try to punch the giant laser puking alien to death. So how do we handle this? And how do we handle the player who enjoys the gameplay, but doesn’t care about the story? I recently had to stop playing Digimon Story: Cyber Sleuth, a game I was fully enjoying, because I just couldn’t stand the hour-long exposition dumps! * We want our story to happen as the player is actively engaging with the gameplay, to compliment it, rather than having it run against it. After all, Gears of Eden is a game; we want you to play it. We’ll see you next Wednesday with the next Dev Update! *I’ll probably go back eventually. I really want UlForceVeedramon.